Luckily, I'm an under-liner. You probably know the type - we always read with pen or pencil in hand, furiously making margin notes and check-marks all over the pages. When we see something we like, we underline. 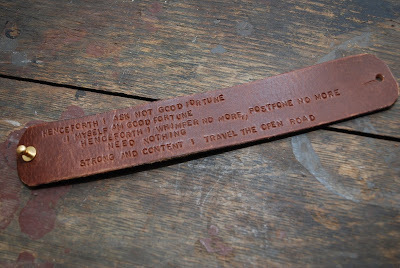 This is great when it comes time to make a hand-stamped leather cuff with a quote on it. As consumers we see a lot of the same quotes over and over again on magnets, mugs, and greeting cards. I'd like to believe that all my underlining has a purpose; it gets quotes out into the world that we might not otherwise see. I keep a few of my favorite books right by me in the studio. When I'm working on a cuff that I think will lend itself well to a quote, I take out one of my favorites and I leaf through until I find an underlined portion that I like. From Oscar Wilde's The Picture of Dorian Gray, for example, I recently pulled out "I want the dead lovers of the world to hear our cries and grow sad." From Edith Wharton's The Age of Innocence I (re)found "Each time you happen to me all over again." With all the novels in my house, there is always sure to be new quote cuffs showing up, so stay tuned. I bought one of your cuffs with a Hawthorne quote - love it!